In the spirit of Every Day Is A Good Day , today really was a good day. 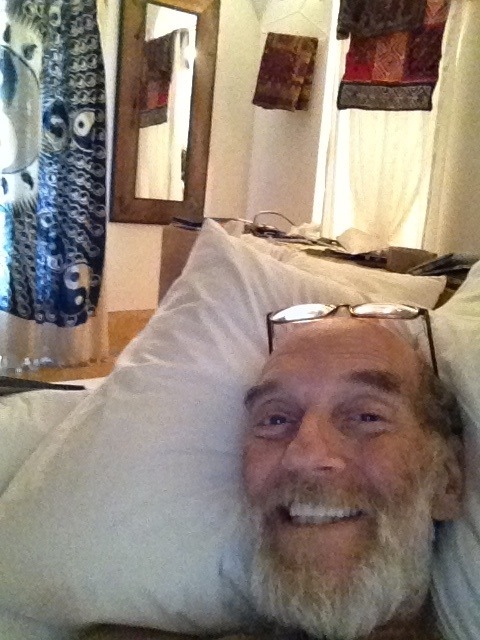 Scott took this iPad selfportrait today after completing several more chapters of his video log of stories. He made a few phone calls to friends, including one to Seemore Simmons who filled us in on the fabulous LA luncheon that took place last Saturday. Following breakfast–chocolate protein shake!–he retired to his bed studio where he completed three more paintings. Later on Scott was able to take a shower standing up and walking back n forth with the aid of his personal trainer David M. Reclining in bed on his newly arrived Australian medical sheepskins from Down Under Wool Scott and I had a heart-to-heart discussion about the future and then enjoyed watching a favorite flick on dvd. Which one? Gladiator. I couldn’t help but notice the resemblance between Russel Crowe and my gladiator….and the themes covered in the film had special resonance for us today. We’ve been preparing all week mentally–and physically–for tomorrow’s move to a hotel in Panjim. This is the city an hour and a half away in South Goa where Scott’s oncologist is based. We’ve had an amazing and memorable time with our dear friends at Sur La Mer Resort that we will treasure forever. This entry was posted in Uncategorized and tagged Going to Goa Blog, russell crowe, Scott Morgan, sur la mer resort, the gladiator, traveling with cancer. Bookmark the permalink.